The week of August 10-16 is the fifth National Feeding Pets of the Homeless “Give a Dog a Bone” Week. The national organization, Pets of the Homeless, asks the public to locate a collection site in their community by visiting their website. Donations of pet food should be taken to one of the identified, local collection sites. Homelessness is still an issue in many cities even as the economy brightens. Those left in the shadows and on the streets with pets are in need of pet food. There are over 475 pet food collection sites across America. Donations of pet food and supplies are received at member collection sites and distributed to food banks, soup kitchens, and homeless shelters which then give the pet food and supplies to their clients. Genevieve Frederick, Founder of Pets of the Homeless, said, "Since 2008, collection site members have taken over 295 tons of pet food and supplies to homeless shelters, food banks and soup kitchens across the country. Some of our volunteers take it to the streets and/or camps where the homeless congregate. It is a combined effort to continue year-round collections of pet food. We applaud the caring, member sites who have reported their contributions. The need is great for communities to continue to donate to this on-going effort." As an outreach to the homeless who own pets, Pets of the Homeless, also uses cash donations to provide veterinary care to pets of the homeless at free wellness clinics as well as emergency veterinary care across the country. Over 10,700 pets have been treated. "Most shelters do not allow animals, so rather than give up their beloved pets, many homeless stay on the streets." Ms Frederick explained, "We provide pet sleeping crates, free of charge, to homeless shelters that allow refuge to the homeless with their pets." 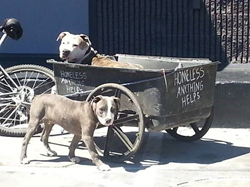 For more information about Pets of the Homeless, visit http://www.petsofthehomeless.org.